At The Well, we don't make people listen to sermons, and we don't sprinkle every outreach or conversation with "Bible talk." We do hope, however, that every person who walks through our doors or meets someone from our community experiences the peace of Jesus during that encounter. We hope this equally for every person, regardless of gender, race, or socio-economic position. At the same time, it is important to recognize that to make this possible for some groups of people, their unique circumstances must be acknowledged and their distinct needs be met. The women who work at The Well and every woman who passes through our doors belong to one such group. During the last several weeks, an outcry over the global treatment of women was embodied on Twitter by the #YesAllWomen hashtag. The trending topic garnered much attention on social media and served as a catalyst for many constructive (and instructive) conversations both online and offline. All of this dialog centers around the sobering reality that women of every nation and background continue to be subjected to objectification, marginalization, and the ever-present threat of violence. Like everyone who comes to The Well, women come seeking to have physical, emotional and spiritual needs met by our community - all needs that Jesus himself cares deeply for. Providentially, the Gospel of John (Chapter 4) offers us a perfect model of this experience. 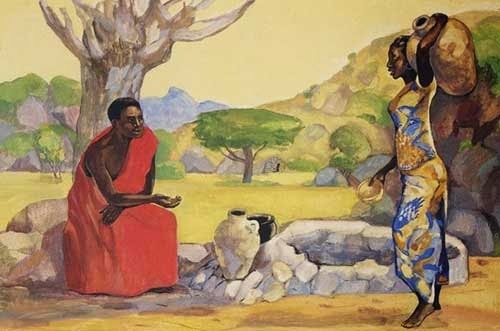 When we look at Jesus' encounter with the woman at the well - and other women throughout his ministry - we find that, like all people, they are objects of love and forgiveness. But a closer examination reveals that in each of those encounters, Jesus' posture with women was also both contrary to the current culture and particularly instructive to men. There are two key ways in which I believe Jesus is teaching us to make him real to the women who work at and visit The Well. This a call to anyone who longs for justice and equality, but is especially an appeal to the men in our community. To experience love, you must first trust the one who extends it. In so many of Jesus' encounters with women, he begins by first breaking down the present-day social barriers between women and men. We must do the same. At The Well, we don't enforce gender roles regardless of our individual beliefs. Our community strives to recognize gender as a part of each other's identity without making it a condition of our individual value. As men, we must deliberately unlearn the patriarchal language and patterns of speech that pervade our communication. You don't need "balls" to be courageous, and to a woman even common terms of endearment like "honey" and "baby" often serve as an oppressive reminder that you're "just a woman." We need to stop making excuses about culture and upbringing - our allegiance is not to culture and upbringing, it is to Jesus and each other. Jesus also was very intentional about protecting women from men who exerted physical power over them. As an ally who treated them with dignity and respect during times of threat from other men, his mere presence provided great comfort to them. The first step we must undertake is to simply be present. Among staff and volunteers at The Well, women outnumber men 2-1. We desperately need more men to make themselves present on a reliable and ongoing basis. Many of our female staff and clients suffer persistent verbal and physical abuse at the hands of men. Women under threat are frequently unable to correct a male abuser for fear of immediate and potentially violent retribution. A man from the community who is present can more safely correct a male abuser, or at the very least ensure that the woman correcting him is safe from retaliation. Again - this is only possible if men from the community are present. Even beyond overt physical and verbal abuse, posture and non-verbal communication are often used to intimidate and dominate women. Within our community and our facilities, we must have no tolerance for even the most subtle abuse. Many of our guests endure hellish conditions of abuse and exploitation on the streets, and The Well should be a place where they are free from that, even if only temporarily. Part of the reality within which we operate is that men often respond better to authority exerted by other men. Anthony, a regular volunteer at The Well, must only stand up from his chair to quiet the room. His willingness to play this role has earned him a nickname, "The Peacemaker." The mere presence of a male staff member or volunteer in the room is enough to prevent most abuse from male guests and the resulting confrontations. The real beauty though of the male peacemaker, is that they also serve as an example of a man who submits to the leadership of the women in the room. As much as men have a responsibility to protect women from other men, we must take care not to slip into the same paternalism used to marginalize and exploit women for millennia. Even as we advocate on women's behalf, we must both learn and teach the truth that both men and women are equal in the eyes of God. As both men and women, we are charged to set the tone of equality and live out example of a healthy male-female relationship dynamic. As both brothers and sisters, we must treat each other as such. Beyond correcting bad behavior and setting a positive example, we also must explicitly teach those who come into or pass through our community how to treat each other. That's the reason for this post, and it's why all of our leaders - men and women, staff or volunteer - should be mentoring others in this regard. This is how we ensure that all those who come to The Well experience peace and love. In doing so, we can counter the cultural meta-narrative that reduces women to nothing but objects, and men to nothing but animals controlled by sexual urges. Imagine for a moment a community where all of those made in God's image work together in harmony building his kingdom, and misogyny is a thing of the past. It is worth the hard work and the uncomfortable conversations - but more importantly, it is a new reality that we are called to make real. You don't have to subscribe to all our beliefs to help. This is a special appeal to all men who share our commitment to creating a place of safety and dignity for women. To learn more about getting involved, please call Lam Robbins at (813) 528-1959, or email lam.vu@vrobb.com. It is very knowledgeable information and I have learnt lot of things from this blog. Gym Classes are very important for health.